Greetings! The big news this week? MACNA!! Our team is on location in Atlantic City for this year’s main event, and Dave will be tweeting on all the cool stuff going on there. I’m sure we can also look forward to a blog recap highlighting the showstoppers. In the news this week: more new species. I’ve said it before and I’ll say it again, the diversity we find on this little blue planet blows my mind. This time the newly discovered critters were found at around 500 meters depth near the Canary Islands. Don’t be expecting to see these deep water oddities in your local aquarium store, but take a look anyway because they’re just cool. There was also this article on a risque new Chimera or Ghost Shark species discovered off the Southern California coast! As if there wasn’t enough at the beach to look out for as a hazard, people in New Zealand now have to be aware of puffers and puffer toxin when they’re frolicking on those beautiful coasts. This piece should hit home with aquarists, too, as fun and adorable as puffers are there is a risk involved in keeping them in aquariums that has to be kept in mind, as the toxin has the potential inflict some serious damage. Read more on puffer toxin in Eileen’s blog about toxins. And now for a look at the future of the aquarium hobby! We all know that leaving our precious aquariums home alone for extended periods of time can be stressful, and many of us can relate to the horror of tank disasters that can occur while we’re on vacation or working long hours. Why not construct your own robot to monitor your tank? Seems like an impossibility? Not when it comes with the help of the braniacs at Erector! The Spykee Robot may be the key to giving you a little piece of mind. I’m a fan of Possum Wrasses. Also known as Arrowhead Wrasses and Pygmy Wrasses, these little beauties are fun to watch, s and they’re reef safe. Their small size makes them suitable for even smaller tanks. The Tanaka Possum Wrasse is the newest arrival! We also received a lovely little Polleni Grouper. Only about 3-4″ and very pretty! Of course, I’ve never seen an ugly Polleni. On the fresh side, the Zebra Loaches that arrived this week are looking particularly robust and active. Those attractive stripes would complement any community tank. The new Bug-eye Squeaker Cats, Synodontis contractus, also caught my eye. Synos are interesting looking cats in general, but the patterns on these are very attractive and the current stock is fat and happy. If you’re on the market for African Cichlids, I recommend the adult Pseudotropheus acei with their spectacular blue color. This blog entry was inspired by another one of the interesting seminars that I attended during this years MACNA conference, a seminar by Author and Hobbyist Mike Paletta “Pharmaceuticals & Marine Aquaria”. Mike’s presentation was based upon medications and treatments that have origins in other disciplines that have found their way into use for the marine aquarium. Some of the medications and treatments that Mike spoke about have been used in the aquarium trade for many years, such as Metronidazole and Erythromycin. Metronidazole was developed for use in human and veterinary medicine, and is used to treat a wide range of bacterial and parasitical diseases. Metronidazole is available in the aquarium hobby from a number of manufacturers, as either a lone agent (like Thomas Lab’s Fish-Zole, Aquarium System’s Hex-Out, or Seachem’s Metronidazole), or as an ingredient in more broad spectrum medications (like API’s General Cure, Jungle Lab’s Hole-N-Head Guard and Parasite Clear) Paletta focused upon the use of Metronidazole as a method for removing intestinal parasites in newly acquired fish. Intestinal parasites are a common problem in wild caught fish. Fish are not usually fed very much as they are moved from collector, to holding station, to export, to your local store, in order to reduce waste and maintain water quality. During this time fish will start to eat feces of other fish that they are being held with, so if any of the wild fish have internal parasites, then they spread rapidly. Feeding new fish with Metronidazole soaked foods during quarantine is the best way to rid your new fish of internal pests, and to prevent infecting the fish in your display. Jungle Labs Anti-Parasite Medicated Food and Blue Lagoon Anti-Parasite Marine Gel Food are commercially available food that is pre-treated with Metronidazole and well work well with fish that will eat these forms of food. For finicky eaters, soak the food of choice with medication prior to feeding. This works well with most food types, including fresh, frozen and prepared foods. Internal parasites may have no outward symptoms. Long term problems such a reduced growth and inability to gain weight with heavy feeding may be the only signs of infestation. Paletta talked about a less common use for Erythromycin (EM) is to aid in the combat of Slime algae in the marine aquarium, one which I have used successfully many times. Slime algae is a rapid growing, and potentially dangerous problem in the aquarium. Severe outbreaks can grow quickly and smother everything in your aquarium. Slime Algae is a simple life form, a bacterial algae complex, which thrives in high nutrient conditions like overfed, overstocked, or dirty aquariums. Small outbreaks should be taken care of by improving water quality, increasing water flow, and physical removal by siphoning. In severe cases the use of EM can be really helpful. EM will rapidly kill slime algae in the aquarium, and help get your aquarium free from the problem. EM is not a miracle cure for slime algae, if measures are not taken to improve water quality, then the slime will return. EM should only be used in conjunction with improved husbandry habits. The portion of Mike’s presentation that I found most interesting was the somewhat experimental use of some Veterinary drugs to combat pests in the reef aquarium. With the proliferation of the reef aquarium hobby, and the abundance coral propagating hobbyists over the last several years, a number of previously obscure pests are becoming more and more common within the trade. Red Bugs (Tegastes acroporanus) have become alarmingly common in the propagated coral industry. These barely visible little crustaceans can rapidly reproduce, and decimate many species of Acropora corals very quickly. Treatments have been developed using Interceptor (Milbemycin oxime), a prescription de-worming medication for dogs and cats, which you have to get from your veterinarian. Several different protocols have been developed for treatment with interceptor, if you do a web search on the topic you can find a treatment plan that best suits your situation. Before consulting with your veterinarian about obtaining Interceptor, it may be a good idea to print out some articles about this new alternative use of the drug. This is not a well known alternative use for the drug, and you may get some resistance if your Vet has not come accross other requests for this use in the past. Another reef pest that is becoming more prevalent in the hobby is the Acropora Eating Flat Worm (AEFW). These nearly invisible, translucent, flatworms attack only Acropora species corals, and are very difficult to detect (other than dead acropora). A good method that Mike uses for detection is to use a turkey baster to shoot a jet of water in and around colonies that are suspected to have AEFW, if they are present, you will dislodge some of them and see tiny translucent discs fly off the coral. There are several commercially available flat worm treatments available to the hobby, such as Salifert’s Flat Worm Exit, and Tropic Marin’s Pro-Coral Cure. Mike Paletta spoke about a relatively new treatment for AEFW that has been developed using Levamisol, a drug commonly used as a pig de-wormer that is available through farm supply stores, or your veterinarian. Again, several protocols have been developed for the use of Levamisol against AEFW, so do some research and choose a method that best suits your situation. An interesting side story of Mike’s presentation was one of his natural approaches to limiting parasites in his display aquariums. He actually trains fish to eat parasites from coral. He accomplishes this while he is quarantining his fish for introduction into his aquarium. The fish he chooses are natural predators of the parasites, in this case I believe they were 6-line wrasses, which he trains to select for the parasites and actively hunt them. While in quarantine he introduces corals that he knows have flatworms, and frees the worms from the coral using a turkey baster, at the same time he limits the fishes other options for food, so that they are forced to eat the flatworms. After “training” the wrasses this way for several weeks the fish start to aggressively hunt out the flatworms for a meal. Once the fish have finished quarantine, they are introduced into the display aquarium and continue to actively hunt for parasites. Pretty neat trick! Just got back from MACNA XIX in Pittsburgh, and I would like to congratulate the Pittsburgh Marine Aquarium Society for hosting and outstanding conference. The next few Blog topics will be about some of the Seminars and Events that I attended at this years MACNA conference. One of the seminars that I found really interesting was the Giant Clam presentation by James Fatherree. James is the author of the book “Giant Clams in The Sea And The Aquarium”and gave a presentation based upon some of the most common questions that he is asked about Giant Clams, and the Answers to those questions. How much light do I need to keep a Tridacna Clam? This is a question that I am commonly asked about clams from our customers here at TFP, and one of the questions that James Fatherree addressed during his presentation. How much light is needed is probably the most important question to be answered, in regard to keeping giant clams in the aquarium. Giant clams receive as much as 100 percent of their nutrition from light that provides energy for photosynthesis for their symbiotic algae (zooxanthellae). How much light depends much upon the species of clam that you are trying to keep. Clams are found in the oceans throughout a wide range of depths in the tropical Pacific Ocean, from near the oceans surface, down to more than 25 meters (83 feet). Some species are only found in fairly shallow water, like the Tridacna crocea, which require very intense lighting. Others Giant Clam species such as T. maximaand T. squamosa, are found at depths of up to 15 meters (50 feet) and required strong lighting. 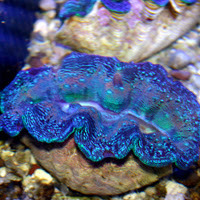 Another species of Giant Clam that is commonly kept in the aquarium trade, T. derasa, is found at depths of up to 25 meters (83 feet) and require moderate lighting. All these depths are extreme maximums, under ideal conditions. The vast majority of clams found in the wild are found at much shallower depths than these maximum. All species of Clams that are grown in commercial farms are typically grown in shallow pools or raceways under intense lighting. The best answer to this question is that there is no such thing as too much light for Clams in the aquarium. Deeper water species, like Tridacna derasa and Hippopus hippopus, will tolerate fluorescent lighting in very shallow aquariums, or high output T-5, VHO, or Compact Fluorescent lighting in aquariums up to about 24” deep. All other clams should only be kept under the intensity of Metal Halide lighting. The deeper the aquarium the higher wattage metal halide light should be used, in general the more light you can provide, the higher your chances for long term health and growth. Hope this sheds some light on questions that you may have had about clams, until next time. 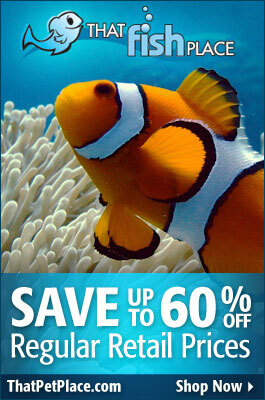 This years Marine Aquarium Conference of North America(MACNA)will be held in Pittsburgh, PA on September 14-16, 2007. This show has grown every year, and this year looks to be bigger than ever. That Fish Place has a booth in the trade show, I welcome everyone attending to stop in and visit, sign up for our free gift certificate raffle, and check out our show specials. I will be doing blog entries from the show, check back to see what is going on. I am looking forward to a great show, hope to see some of you there.